Ipswich Town: Cooper, Burley, Mills, Thijssen, Osman, Butcher, Wark, Muhren, Gates, Brazil, Woods. Sub Beattie. Chester: Millington, Jeffries, Walker, Storton, Cottam, Oakes, Sutcliffe, Jones, Rush, Phillips, Howat. Sub Burns. 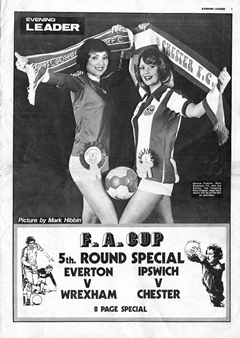 Ipswich Town pay their first ever visit to Chester for today’s FA Cup fixture. The only previous meeting between the two sides took place in the FA Cup Fifth Round at Portman Road in the 1979/80 season. On that occasion Ipswich were unbeaten in twelve games and flying high in the old Division One while Chester were mid-table in Division Three and making only their third appearance in the last 16. Ipswich, widely tipped to reach Wembley for the second time in three seasons, were managed by Bobby Robson and included familiar names like England internationals Mick Mills and Terry Butcher but their shining lights were Dutch masters Frans Thijssen and Arnold Muhren part of the new wave of foreign internationals in English football. Chester, led by player-manager Alan Oakes, had reached the Fifth Round after victories over Workington, Barnsley, Newcastle United and Millwall and were heavily reliant on the goals of teenage sensation Ian Rush who had scored 12 goals in his previous 18 games. The youngster, who was being closely tracked by Manchester City and Liverpool, lined up without his regular striking partner Peter Henderson giving a rare opportunity for Ian Howat, another product of Cliff Sear’s youth team. Chester started the game confidently and took a surprise lead in the ninth minute when a hopeful punt upfield by central defender John Cottam was met by Brynley Jones. The Welsh midfielder, one of the smallest players on the pitch, managed to evade the marking of the giant Ipswich defenders and sent a looping header over keeper Paul Cooper much to the delight of the large Chester following behind the goal. 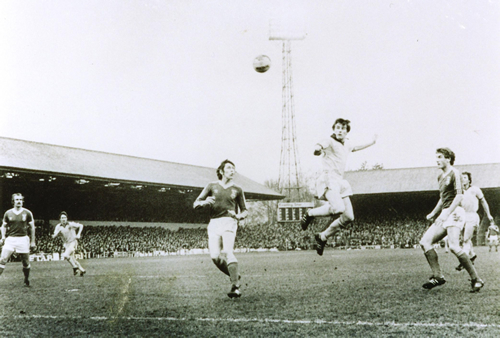 For thirty minutes a first ever appearance in the sixth round looked on the cards as flying winger Peter Sutcliffe and young Rush caused problems in the Ipswich defence but gradually the home side got a grip on the game and in-form keeper Grenville Millington had to be on his toes to deny Eric Gates after a poor back pass from Oakes. With half time approaching Chester were dealt a cruel psychological blow when Ipswich turned the tie on its head with two goals in three minutes. First of all full-back George Burley dived to head home a Thijssen cross. Then, in the 44th minute, Burley centred for Gates who laid the ball back for John Wark and the Scottish international volleyed in from close range. Brynley Jones opens the scoring for Chester. The second half failed to produce the excitement of the first forty-five minutes as Ipswich controlled the game without ever looking like they would run away with the game. The Dutchmen, Muhren and Thijssen, gave masterful performances in midfield and showed why they were so highly rated while Jones and Ronnie Phillips battled admirably for Chester. With seven minutes to go Howat had the chance to set up a replay at Sealand Road but he shot into the side netting while Millington had to be alert to block Alan Brazil’s stinging drive in the closing stages. After the game Bobby Robson was full of praise for the Chester performance admitting that he had been worried after his side had conceded the early goal and suggesting that their brave display had deserved a replay. However a more realistic Alan Oakes recognised that Ipswich were the better side and just about deserved the narrow victory. Nevertheless it had been a gritty performance and Ipswich had been given some nervous moments and forced to work hard for their place in the last eight. 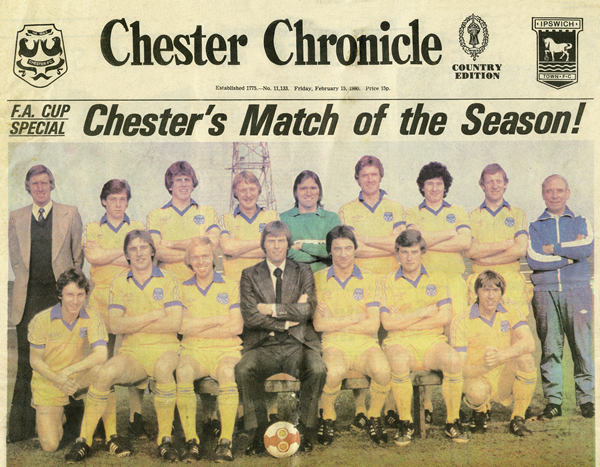 Team picture from the front cover of the Chester Chronicle special supplement. Back: Cliff Sear (assistant manager), David Burns, John Cottam, Ian Howat, Grenville Millington, Trevor Storton, Paul Raynor, Jim Walker, Vince Pritchard (trainer). Front: Peter Sutcliffe, Peter Henderson, Ron Phillips, Alan Oakes (player-manager), Ian Rush, Brynley Jones, Derek Jeffries.